When gardening by the moon, all normal rules for gardening apply, especially the plants specific requirements of heat, and the health of your soil! Lunar planting has been proven to be more effective in organic, non-chemically treated soil. There is no substitute for creating a wonderfully rich micro-climate by continually adding organic matter to your growing beds. This creates a living system that includes microbes to break down the soil, and adds nutrients and nitrogen content. This is the backbone of healthy, disease resistant plants. Think of your garden as a complete ecosystem that includes life and decay in the soil, and the needs of the plants. Work in harmony with nature to duplicate and replenish the essential elements at the base of the food chain. If your soil has been chemically dependent for a long time, you need to make the changes in stages, because you have created a situation where the plants are artificially protected by those chemicals. They only get nutrients from what you feed it, and none from the natural breaking down of matter. If you take that away without compensating for it you could have problems. Too much nitrogen from chemical fertilizers can weaken plants. Even though they may look lush for a while, if they are putting too much energy into leaf growth, the resistance to disease suffers. The first step is to increase the health of the soil, so it becomes alive again. You need to add as much organic matter as you can. If you don’t have snow on the ground it is not too late to do this. Pile on the shredded leaves, mulch, manure and even cardboard, and just let them break down over winter. Soon you will attract the worms, helpful fungi and other tiny creature that feed on the soil and break it down for you. Healthy soil has trace minerals, which can be added through powders like kelp meal, rock powder, or bone meal, and gives a slow steady supply of nutrients. When the soil is improved, then you can back off the chemicals. Permanent beds that are never walked on concentrate the good amendments in one area. Keeping it uncompacted will pay off in the ease of turning, and the health of the root systems of plants. You don’t even need to have solid sides to the bed. Just mound the soil to a width that you can reach across, and treat it as sacred ground. You need to replenish the nutrients that the plants have used every season. One to three inches of compost a year is a good rule of thumb. If the soil is not compacted, the worms will even do the work of turning it in for you. In order to create a more disease and pest free environment, try to cultivate favorable conditions for beneficial insects, butterflies and bees. Encourage a diverse environment where they will live, reproduce and prosper to do the work of bug control for you. Avoid chemical sprays, opting for the least invasive methods of control. Try hand picking pests, or using insecticidal soap, which will kill the good bugs on contact, won’t leave harmful residue and lasting effects. Pick off and squish beetles, cabbage loopers; rinse off aphids with a strong blast of water. Floating row covers are a great thing too. They are light weight blankets that create a protective barrier so the buggers can’t get to your plants. Seal the edges well with dirt so they can’t get in. 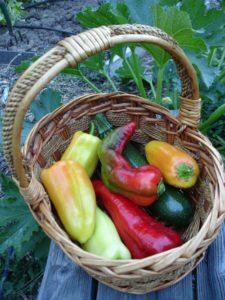 Provide crops that offer food and homes. 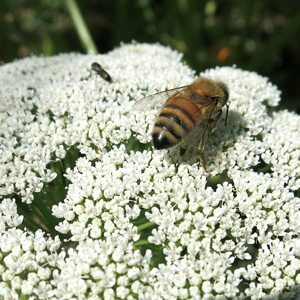 These include many herbs like dill and parsley, yarrow, nasturtium, angelica, strawflowers, daisies, cosmos, Queen Anne’s lace, even weeds. Let some lettuce, parsley, cilantro or dill go to seed, then scatter the seeds around the garden. This keeps the butterflies happy, providing a continuous supply of food (for both of you!). Bees love borage, lavender, oregano and thyme. 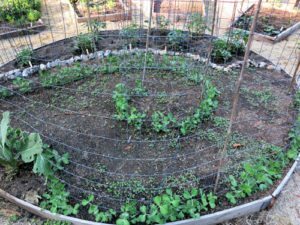 Remember to do succession plantings, especially of quick crops like lettuce, bush beans, radishes, spinach, carrots, and beets. That means planting again, as your first crop is reaching maturity. This will keep you in continual harvest especially if you are blessed with a long season. 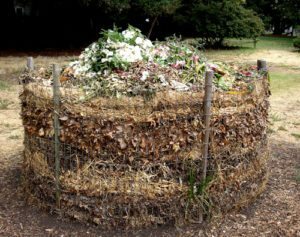 It is not difficult to start a compost pile, especially if you are not in a hurry. The basic formula is to layer equal parts brown matter (straw, dried leaves) and green matter (grass clippings, plant matter, kitchen scraps, manure). The smaller the particles that you put in the pile, the faster it will decompose. Keep wet, but not too wet. The more you turn it, the faster it will work, but it will work eventually. Rot happens! Working with the timing of nature helps tip the balance in your favor. You can start seeds inside under lights or in a greenhouse, and have them ready to go in the ground when the time and temperature are right. Use the micro-climates created by overhead cover, ground slope or bodies of water to plant marginal crops that need a warmer spot. Stay aware of the seasons. Don’t be afraid to plant beyond the usual times if it looks mild, or to use row covers and cold frames to extend the season. Life is full, however, and sometimes you just can’t plant at the perfect time. It may be more important to plant before a storm comes, before the plant has outgrown its container or before it is too late in the season. Feel free to use your best judgment. You may have to choose if it is best to plant in the correct moon phase, or a fertile sign of the zodiac, as your time allows. Or if you have to plant in the wrong phase, at least give it any advantage possible by working in the fruitful signs. You could consider the leaf/root/seed/fruit associations to find a favorable day. If the carrots need to be planted, but it is still the first or second quarter, choose a root sign day. I just wanted to tell you how your calendar has helped me create a successful garden. I had the perennial black thumb, and I was a bit skeptical that it would work…but I figured if it didn’t work…it was not as bad as spending money on a plant that I’d probably just kill anyway. I decided to buy some seeds and test the calendar. I followed the directions and advice. I started seeds indoors and was shocked that they actually grew. Transplanted them into the garden and was very happy that they grew bigger. Today I have tomatoes, lettuce, cucumbers, squash, onions, borage, marigolds, peppers, watermelon, melons, cilantro, thyme, 3 types of basil, sunflowers, dill, chives, sage and even some sweet potatoes that I started in my kitchen. I look forward to a good harvest. My friends and neighbors can’t believe that I grew these plants from seed and that the plants are thriving. Sometimes I don’t believe it!! I love how it has simplified my gardening, even beyond the enjoyable raised beds and Square Foot gardening that I do. I love how the planting dates set up my gardening month for me. I don’t feel guilty when it’s a day of no planting, just cleaning things up, or relaxing to enjoy the scenery. What I’m saying is, I like how it paces us. I have enjoyed my years of Moon Phase gardening so much, thanks to you!